Stomatitis is a debilitating oral condition occasionally noted in cats. Here's what we know about it and what we do about it. Stomatitis means "Inflammation in the Mouth"
Cats with Stomatitis have very painful areas of inflammation generally in the back of the mouth. It is often back far enough that it is diffucult to see. Because of the pain, most stomatitis patients are very reluctant to open their mouth. They have poor appetites, may not drink much either, and often have drooling and a foul oral odor to boot. The hypersensitivity is to bacteria and proteins associated with them. 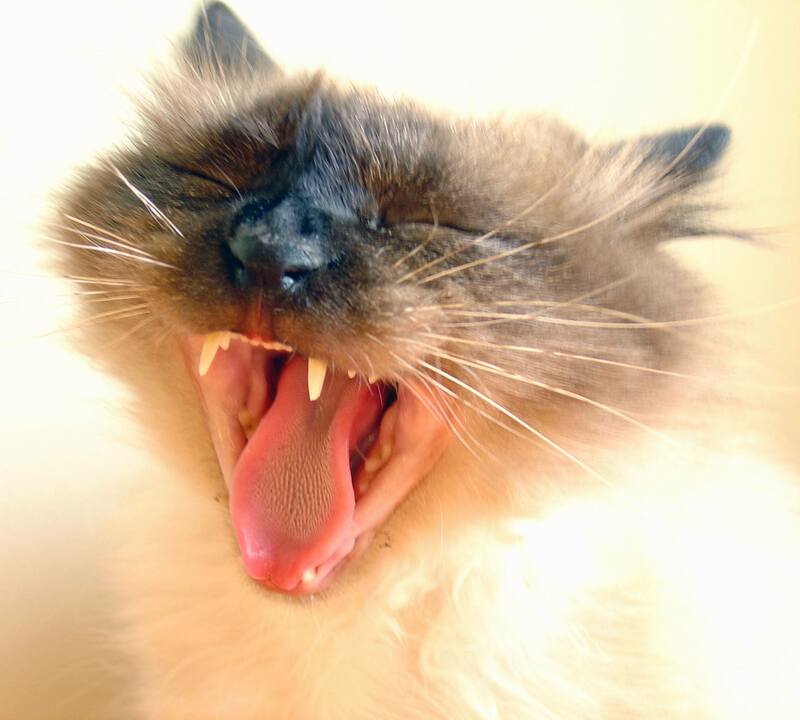 Normally, there are dozens of kinds of bacteria that live happily in the feline mouth. And normally, the feline immune system is OK with that. However, in Stomatitis cases, there is a glitch in the immune system that results in the innune system no longer being OK with having so many bacteria growing in the mouth. We do not know what causes the glitch, but at present the best guess is that a common viral infection called Feline Calicivirus is what triggers the problem. It's really a complex situation, because most cats that have contracted Feline Calicivirus do not develop stomatitis. Also, 25% of the cats with stomatitis also have Feline Leukemia or Feline Immunodeficiency Virus infections as well. There is a lot we don't understand about this condition. To complicate the matter further, a fair precentage of cats with stomatitis will also have a condition known as Resorptive Lesions at the same time. It is unclear whether this is a causw or an effect of stomatitis, but it can make treatment more difficult. The Various bacteria all live in what is know as a "biofilm"
Normally, the various bacteria in a cat's mouth live in what is known as a biofilm. A biofilm is a thin layer of protein and mucus that adheres to the teeth and gums and insides of the cheeks. A biofilm that may be more familiar to many of us is plaque. Plaque is a biofilm that adheres to our own teeth, and is responsible for causing cavities and bad breath. When the immume system glitches and no longer tolerates all those bacteria living in the mouth, a severe inflammatory reaction ensues. The immune system tries to eradicate the bacteria by releasing all kinds of inflammatory things. Severe sores develop in the cat's mouth, gums, and cheeks. We are currently not able to cure the immune system glitch. Let me repeat that: We are currently not able to cure the immune system glitch. However, we have several tools at our disposal to eliminate or at least reduce the symptoms. The teeth are the major place the biofilm is found. In other words, a lot of bacteria grow on the teeth. The best treatment for stomatitis is to extract most if not all of the teeth. This reduces the amount of bacteria present and reduces the inflammatory response. We often start with just the rear teeth, the ones behind the big canine teeth. Often this is enough to reduce the bacterial population enough to provide adequate relief, and it spares the patient the major surgery of having all the teeth taken out at once. If partial extractions do not provide the relief we are seeking, we can go back and remove all the rest of the teeth. In patients that have severe stomatitis, we often go straight to full-mouth extractions. At this point we should mention that tame cats don't need teeth. Teeth are necessary only if the cat has to survive by catching and eating mice. Since we feed catfood to our tame cats, this is not a problem. Cat teeth are not designed for chewing catfood in the first place. There are no flat spots for them to grind the kibble like we would anyway. At best they crack it in half then swallow the halves, and it is not a big leap to just swallowing the kibble whole. We have many toothless cats in our practice who prefer dry food to wet, and are plump and happy eating it. Cats with stomatitis are much happier without their teeth than they were with them. It is a big deal to remove all the back teeth. It is an even bigger deal to remove all the teeth. We do it surgically to eliminate broken retained roots, and we suture the extraction sites up. They heal quite quickly, within a week. We provide excellent pain medication for the healing process. Most cats do well with the procedure. It takes a lot of time to extract that many teeth, and so the procedure does cost quite a bit. Most patients end up costing between $600 and $700 for the rear teeth. Full-mouth extractions often cost $700 to $900. Each case is different, and costs depend on the presence of resorptive lesions, the conditions of the gums, etc. The prognosis is "pretty good"
As we have mentioned before, we can't currently fix the underlying immune system glitch. However, we are usually quite successful at controlling the symptoms, and can improve the quality of life for almost all our patients. Some patients respond very well and are nearly inflammation-free. A more common outcome is for there to be some remaining inflammation, but not enough to cause much of a problem. These patients are able to eat comfortably and do well. A few indivuduals will not respond much to even full-mouth extractions and remain somewhat painful, although they are much better off than they were before treatment.